Single Minute Exchange of Wax (SMEW) has finally arrived! MPI’s new removable wax-conditioning reservoir and docking station was designed for wax rooms with more than two waxes and will instantly reduce downtime while dramatically improving productivity. The system allows you to condition multiple waxes simultaneously. 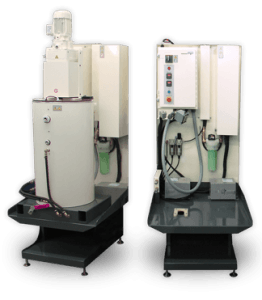 To change waxes, simply remove the reservoir on the wax injection machine, and quick-connect it to the docking station where it would remain fully conditioned and ready for next use. Place the next reservoir, which had been fully conditioned on the docking station to the injector, and get back to production. The universal docking station will work with all MPI removable reservoirs and you can utilize as many reservoirs and docking stations as your business requires. 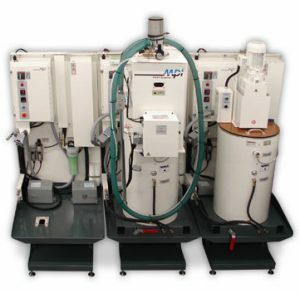 Eliminate the downtime required to drain, clean and purge a wax injection machine reservoir before introducing a new wax. Continuously melt and condition wax offline so it is ready when needed. Change over to any wax selection in a matter of minutes. Ensure that the right wax is always available for the right part. Maximize labor hours and wax-room throughput. Three docking stations together for ultimate productivity (shown with two removable wax-conditioning reservoirs, one with a wax melter installed). Equipped with quick connect fittings for electrical and cooling from the reservoir. Designed to provide power and temperature control for the wax reservoir even when it is not in use. Easy access shut-off valve and mounting system simplifies reservoir transport from the machine to the docking station. Docking station features quick connect fittings for water, air and power. Docking station controls allow you to monitor the wax in the reservoir so it will always be ready. Includes quick-connect fittings for optional pellet loader. Portable reservoirs can be changed using optional reservoir transport cart.